The interdisciplinary field of materials science involves the discovery and design of new materials. Because of this, materials science has effective interest in the fabrication of biosensors/ nanosensors. In this review, we have focused on molecular imprinted electrochemical sensors based nanomaterials such as graphene oxide/carbon nanotubes molecular imprinting has been very effective method to achieve high selectivity and sensitivity for the fabrication of sensors. 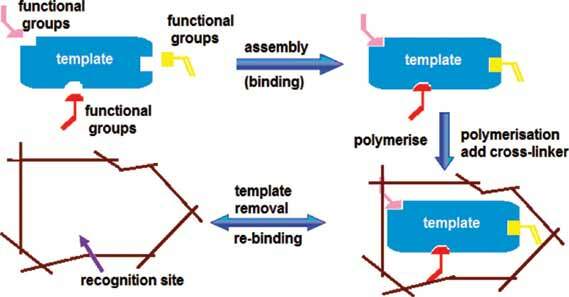 It is based on the formation of three-dimensional nano-cavities in crosslinking polymer matrix, where the functional and crosslinking monomers are copolymerised in the presence of target molecule (imprint molecule), which acts as a molecular template. In an imprinted polymer, the chemically active moieties of the target molecules are held in position by the highly crosslinked polymeric networks. In addition, the novel nanomaterials such as graphene/carbon nanotubes have many applications in sensor technology. The review presents the recent developments related to molecularly imprinted electrochemical sensors based carbon nanomaterials. Nanotechnology, molecular imprinting, carbon nanomaterials, nanoparticles, electrochemistry. Department of Chemical Engineering, Faculty of Engineering, Pamukkale University, P.O. Box: 20070, Denizli, Turkey.